Lorenzo Cain is the gold standard for home-run robberies. That’s nothing new. What is new is how easy he can make it look. In his latest impressive feat, the Milwaukee Brewers center fielder stole a home run from St. Louis Cardinals third baseman Matt Carpenter on Monday, and he did it with his eyes closed. Although different replay angles don’t give definitive proof of whether the ball would have cleared the fence or bounced in or out of play, the catch was still impressive. Cain has long been one of the league’s elite defenders, despite not having won a Gold Glove award. By several advanced metrics, he was the best defensive outfielder last season, pacing the position group with 22 Outs Above Average, 20 Defensive Runs Saved. Cain is particularly adept at going back on tough plays. According to Statcast, 14 of his 22 OOA came from balls hit behind him, including a league-best seven back and to the right — the direction of Carpenter’s blast. Carpenter is far from the first player Cain has robbed of a home run, but he’s also not the only Cardinal to have one stolen this season. Cain snatched a homer from José Martinez on Opening Day, which was also going back and to the right at Miller Park. 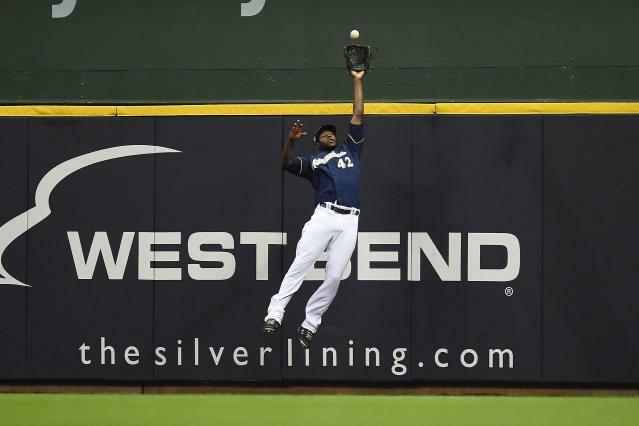 This catch was been even bigger, though, since the Brewers were only up one, and Cain’s catch was the final out. The bad news for the Cardinals is they still have to face Cain and the Brewers 14 more times this year, including five more times in the next eight games.